Tonight, I'm going to the next to last performance of this Broadway production of Gypsy. Coincidentally, my friends Leah and Chelsea decided they wanted to go to this Gypsy and that this would be the weekend...it's a good thing we got the tickets because then we learned that it was closing sooner than later. And it's kismet, because it's the first Broadway show for these opera vets, Leah and Chelsea! Virgins for Patti! I'm Pattitizing them!! And oh boy, it's with fire. No doubt, they'll never be the same. Neither will I. And I'll miss Gypsy. Truly, I will. I am eternally grateful to Gypsy. It is more than a show to me - my first Gypsy in January, 2004, with Bernadette, started me on a road to full pursuit of all things Broadway and Sondheim and Divas. It has also given me many wonderful friends because that's what Gypsy does. Best of all, that first Gypsy gave me my Little Love, Noah, and great friends Vicki, Karen 1, Karen 2, Mandy, Renee S., Kate B. and my special Uncle Lindsay Kevin. Patti's Ravinia Gypsy gave me more fun with Kari and Kristen, and for the very first wonderful time Bob and even Billy Boy because Little Love and I went to Chicago for it. 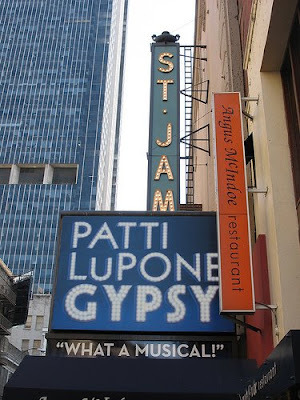 By blogging about the Ravinia Gypsy, it gave me Steve on Broadway. Gypsy has the power to bring people together with fun, laughs, fellowship and love and gives them reason to travel and want to be together and witness it whether it's across the country or in our own backyard. So, until we see it again, I'll savor the cast recordings of Merman, Lansbury, Daley, Peters and LuPone. You know I'll spend time speculating on who the next inconic Mama Rose will be. And I'll count the days until I can see Gypsy again. Are you telling me I won't see you at the last Gypsy? I hope not! Oh and yes, Gypsy is THAT magical! PS. DM has expressed her interest in the role. I vote yes! Darling Renee, The Last Gypsy just wasn't in the cards for me...but yes, DM would be a-ok with me!